A lot of descriptors probably come to mind when you think of Lexus vehicles: “luxury”, “prestige”, “success”. Now, with the introduction of the 2018 Lexus LC 500, you can add “power” to that list. The first thing that will strike you is its appearance. It’s wide, aggressive, and exceptionally modern-looking. Just look at that massive grille! That’s the look of a performance vehicle that is not to be trifled with. What began its lifecycle as the LF-LC Concept car at the 2012 North American International Auto Show is now a production vehicle with many of the design elements and proportions of the car that inspired it. So yeah, it looks amazing. But what’s under the hood? I’m glad you asked. How does a 471-horsepower, 5.0 litre, all-aluminum, naturally-aspirated V8 engine sound to you? Are you trembling because you’re excited or scared? Maybe a little of both? One thing is certain, neither you nor your passengers will find anything boring about going from zero to 100 km/hr in about 4.4 seconds. 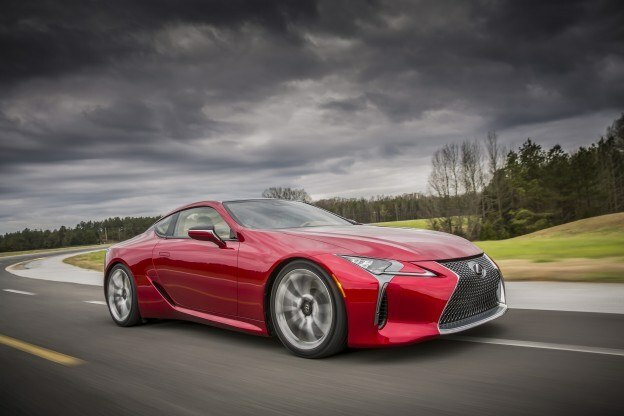 Lexus’s new Luxury Coupe – that’s what the LC stands for – accomplishes this with their first-ever 10-speed automatic with manual shifting mode and a new rear-wheel drive platform. Well, and all that horsepower, of course. After you calm down a little from your initial reaction of how great this car looks, you’ll notice it features classic sports car proportions mixed with futuristic design. Yes, it’s got that signature Lexus spindle grille, but it’s lower-slung than on other Lexus models. 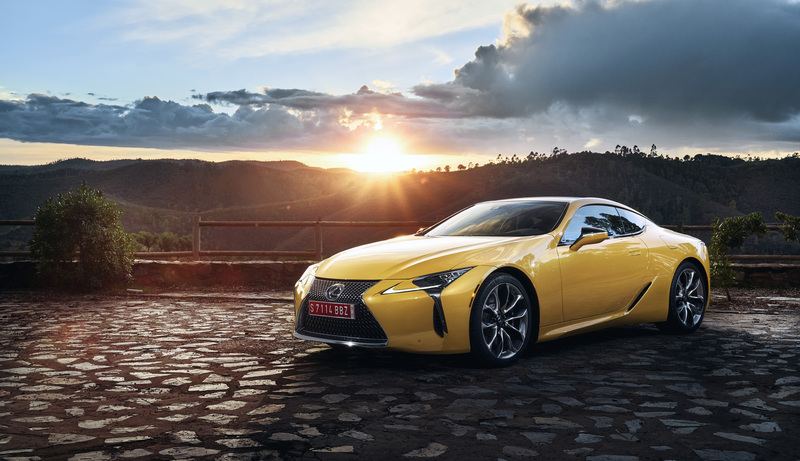 In the design and production of the LC 500, Toyoda challenged his designers and engineers to adhere closely to the spirit of the LF-LC concept while crafting this new, high-performance luxury coupe. Weight reduction was made a priority, so the LC 500 drives on flat tires (with no spare) and the battery has been relocated to the trunk. An optional carbon fibre roof also contributes to this car’s speed machine credentials. If you like big wheels – and you cannot lie – then the 21-inch bad boys on the LC 500 are going to be right in your, uh… wheelhouse. As for between the doors, you can customize the cockpit-focused interior to your tastes, with options for an all-leather interior, sport seats and more. As a nice added feature, the passenger-side grab handle makes it difficult for your passenger to mess with the radio. The driver picks the tunes, and that’s that! Staying in the lane of innovations in the LC 500, it showcases the first application of Lexus Enform, a connective automotive technology system that is complimentary for its first year. Enform features include a stolen vehicle locator, 24-hour emergency assistance, enhanced roadside assistance, automatic collision notification so emergency services can be sent to your location, and service alerts to keep your coupe running smoothly. Plus, you can use the Lexus Enform Remote mobile app to start your car and get the heat or air conditioning going, or even find your car in a big parking lot. There’s also a guest driver monitor so you can check on your kid’s driving when he or she takes it out for… OK, there’s no way you’re letting your kid drive this. Let’s be real. The Lexus LC 500 isn’t available to test drive just yet – I know, what a tease! – but it will start appearing at your closest Lexus dealer soon. It’s okay to get excited.